October 13 2015, 4:48 p.m. This article, which accompanies Heloisa Passos’ film Birdie for Field of Vision, is the first of a two-part series. The second part accompanies the film Karollyne. AS IS TRUE of so many cities in the Western world, there are thousands of homeless people living on the streets of Rio de Janeiro, the second-largest city in Brazil. They include families, children, solitary men and women, the old and the young. Many have been homeless for years with little prospect of an exit, especially now that the country faces worsening economic distress, met with often-cruel austerity measures. Homeless people are abundant in most neighborhoods, including the upscale ones most frequented by tourists. 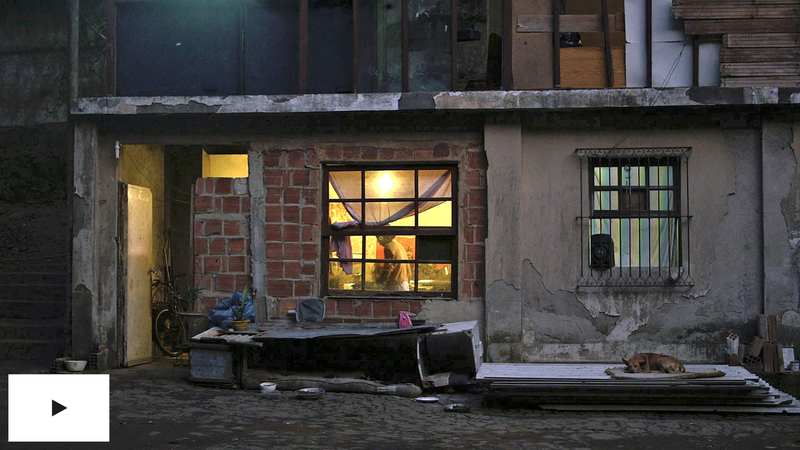 Homelessness in Rio is, in many ways, virtually identical to how it manifests in other large cities: It entails unimaginable material and emotional deprivation, hopelessness, societal invisibility, and utter isolation. But one aspect of Rio’s homeless population stands out: A huge number of them have dogs that were previously living as desperate, unwanted strays on the street. Many have lived on the street with their dogs for years. They care for them as well as, and in many cases better than, the average middle-class family with a pet. The profound bond that forms between them is like nothing else one will find, and is thus deeply revealing. 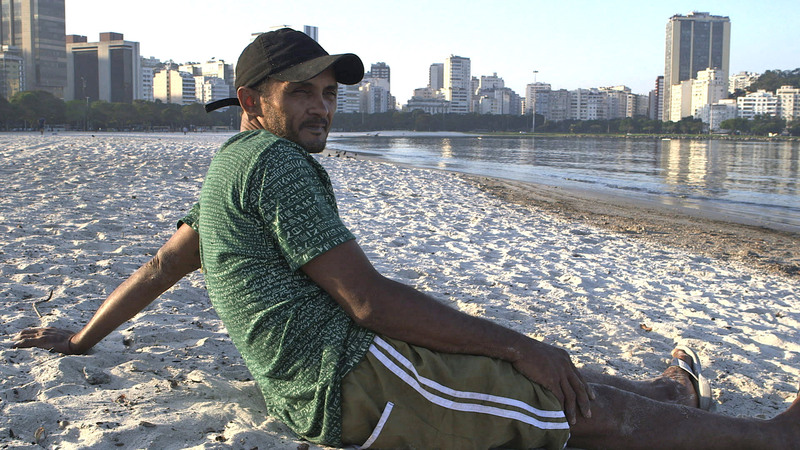 Watch Birdie, a movie about Rio’s homeless and their dogs, by Heloisa Passos. There’s a vast diversity to how the city’s homeless live with their dogs. 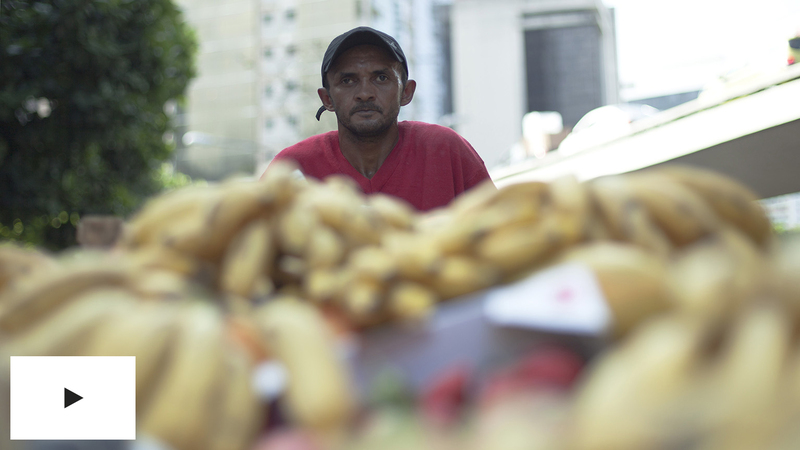 Anderson Bernardes Carneiro (“Birdie”), the subject of today’s Field of Vision film (click play on the recorder above to watch and click here for an interview with the filmmaker), is a 35-year-old fruit vendor from the Amazon who spent 12 years in prison and now lives a largely solitary life on the Rio streets with his two dogs. Karollyne, the subject of this week’s other film from FOV, is a trans woman who is effectively the matriarch of an eight-person homeless encampment in the forest that collectively cares for 19 dogs (along with four cats), almost all of which were abandoned by people who simply decided they no longer wanted them and so just dumped them out of their cars in the forest to starve to death. Some of the homeless people are couples who nurture their dogs like their children. Still others are protected by their dogs as they sleep in dangerous areas, while some put their dogs to work with them as they panhandle or put on shows for donations. But in all cases, the brutality of homelessness combines with the particular ways dogs relate to humans to create a remarkable emotional and psychological connection that is often literally life-saving for both. Watch a trailer for Karollyne, a movie by Heloisa Passos. To immerse oneself in this phenomenon is to learn about the human capacity for empathy and self-sacrifice even in the most severe states of distress. This subject also enables us to better comprehend the universal human need for love, companionship and social integration; the destructively false nature of stereotypes we implicitly embrace about human beings who live on the street; and the special ability of dogs to penetrate, touch and fulfill the exact emotional and psychological realms which humans often protect most vigilantly. Being open to these insights requires the setting aside of many entrenched preconceptions. Professor Irvine recounts the cynicism and even anger she felt after interacting for the first time with a homeless man and his dog. Worried about the dog’s exposure to severe heat in the Colorado desert and assuming she lacked food and water, Irvine first tried to “save” the canine by offering the homeless man money to buy her. When he angrily refused her money, she actually called Animal Control hoping they would “rescue” the animal, only to be told that they were unable to act since she wasn’t being harmed. Only later, after she began studying the relationship, did she realize that dogs are often more important to homeless people than they are to domiciled people and thus they care for them better. So intense is this devotion that many homeless people refuse offers of shelter if the facility bars them from bringing their dog. They’d rather sleep on the street with their dog than in a bed without him. When, many years ago, I began noticing how many homeless people in Rio have dogs, cynicism drove my reaction as well. I tacitly assumed it was a ploy for sympathy and thus more effective panhandling aimed at dog-lovers. That ugly assumption quickly dissipates upon speaking to them, or seeing them when they don’t realize anyone is looking as they hand-feed their dogs, administer medicine, jovially play with them, kiss them or be kissed, or sleep in a mutual embrace. Humans most cherish that which is most important to them, and for someone living on the street without anyone or anything else, their primary devotion is to their dog. And that devotion is returned from the dog who also has nothing. Karollyne and one of her dogs. What first commanded my interest in this relationship were the reactions to my earliest offers of help. Physically losing your dog, becoming permanently separated, is the nightmare of every dog-lover. As a result, I’d typically offer to buy a leash. The reaction was almost universal: “I don’t need that. She follows me wherever I go. We’re almost never apart. And when we have to be, she waits here for me until I return.” The person/dog connection in the homeless context is one of complete togetherness, which in turn produces a physical and mental bond as reliable as any leash. In lieu of an unnecessary tethering rope, they’d typically ask instead for medicine the dog needed or for dog food. At least in my experience, not a single homeless person ever attempted to convert an offer to buy something for the dog into something for themselves: that had to be separately pitched. It quickly becomes apparent that the welfare of their dog is their highest priority and most pressing concern. In other words, those with the greatest personal needs are simultaneously driven by immense levels of self-sacrifice for another living creature. It’s common to see homeless people take dishes of food someone gives them and, despite being hungry themselves, instantly divide it in half and give it to their dogs (hence the name of Irvine’s book: My Dog Always Eats First). It’s equally common to see homeless people in squalid clothing sitting next to their well-groomed canines. Many of their dogs stay up while the human sleeps to guard against thieves or other threats, something of great value in many parts of Rio. The homeless person and the homeless dog find each other and bond in shared deprivation and self-sacrifice, fulfilling needs that would otherwise go completely neglected. The care-taking is not a one-way street; it’s mutual. When homeless people talk about their relationship with their dogs, they are very clear about its value. Many — probably most — identify the worst part of homelessness as being not the material struggle but, rather, enduring total social invisibility and isolation. Most people, out of a combination of guilt and fear, simply pretend the homeless are not there, passing them on the street without even registering their existence. This process is dehumanizing in the purest way: They are not even visible to other humans, let alone worthy of communion. They have no societal function or role; it’s total detachment. Their dogs provide a bridge to human contact, which individuals need as much as food or water (that’s why prolonged solitary confinement is torture and inevitably breeds mental illness). People who love dogs are often drawn first to the homeless dogs, and then to the indigent humans who care for them. The fact that their fellow dog-lover is homeless quickly becomes irrelevant. It’s thus not only easy, but inevitable, that any dog-lover will — regardless of their background — find common experiences, perspectives and emotions with a homeless individual whose dog is also important to them. The experience of caring for and loving their dog becomes one of the few means homeless people have to find a connection to the broader society that otherwise shuns them. It’s sometimes the only connection. Birdie describes his experience this way: “If I lie there on the sidewalk, nobody talks to me. They even change their path to avoid me. … But if the dogs are playing, they’ll say: ‘oh, how cute. '” Even knowing that it is the dogs, and not him, that trigger the interaction doesn’t dilute the importance of being seen. This relationship with his dogs enables a critical human need: to be acknowledged by other humans. Birdie on a beach in Rio. But there is far more to this bond than the pragmatic benefit of social integration. The non-judgmental quality of the dog is central. To live on the street is to endure constant, implicit condemnation. The homeless know exactly what society thinks of them. They see it embedded in every effort of avoidance, every expression of police suspicion, every gesture of condescension and discomfort even from those who stop to give them money. They’re sometimes told that they’re not worthy even of having pets. Dogs think none of those things, harbor none of those judgments. Dogs strip away the extraneous and artificial metrics: They simply love and adore and protect those who treat them well. As Birdie puts it in the film: “If the other is more beautiful or uglier, richer or poorer, people always talk about each other. Dogs don’t.” For people living on the street, being showered with love, affection and appreciation can fundamentally alter the world, and many get that only from their dogs. Ultimately, we don’t fully understand the human/dog relationship because we don’t and can’t fully understand dogs. They perceive the world differently, think about it differently, react to it differently. And they certainly respond to humans far differently than other humans do. Because they’re predisposed to have this close social relationship with humans, everything about them — their facial expressions, their body language, their tactile sensations, their means of expressing emotions — can trigger emotional and psychological responses that, for many people, are otherwise inaccessible. In industrial-age Western societies, the traditional hunting and herding functions of dogs has diminished, but the human/dog relationship has become increasingly more popular and more prioritized (both Brazil and the U.S. are at the forefront of that trend). That’s because dogs uniquely provide something deeply valuable to humans. It’s tempting for any human being to harden oneself: to construct a rigid, self-protective shell around our most vulnerable emotional and psychological needs in a futile effort to make them disappear, thereby eliminating the pain that comes from their sitting unfulfilled. That effort never succeeds — those needs are intrinsic to being human and can’t be willed away — but what that self-hardening process can produce is fear, bitterness, lovelessness, and infinite frustration. The temptation to self-protectively close oneself off this way is particularly compelling for someone who lives on the street and has little prospect for fulfillment of those emotional and psychological needs. Dogs break through all that. They reach and enliven the psychic and emotional parts of humans that are often the most neglected. For those who live in a state of extreme deprivation, that is an immense gift, one that produces both happiness and gratitude. Those emotions in turn produce their own set of gifts for the stray dogs who attach themselves to homeless humans, creating a reciprocal, self-fueling cycle of mutual care and affection that constantly fortifies the bond. We can obviously learn a great deal about homelessness, and about dogs, from watching glimpses of the lives of people like Birdie and Karollyne. But we can also learn critical insights about ourselves. You can view Birdie here and read an interview with the director here.